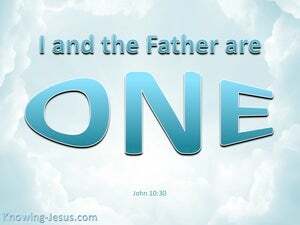 ﻿ John 10:30 I and the Father, are, one. 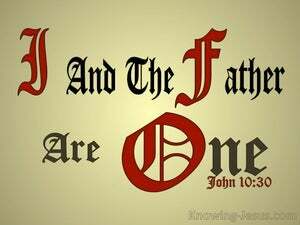 I and the Father, are, one. 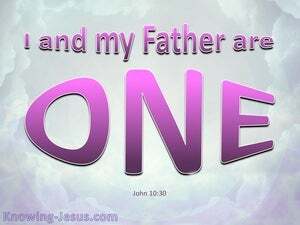 And I and my father are one." I and my Father are one ??." I and the Father are one. Then the Jews again took up stones to stone Him. 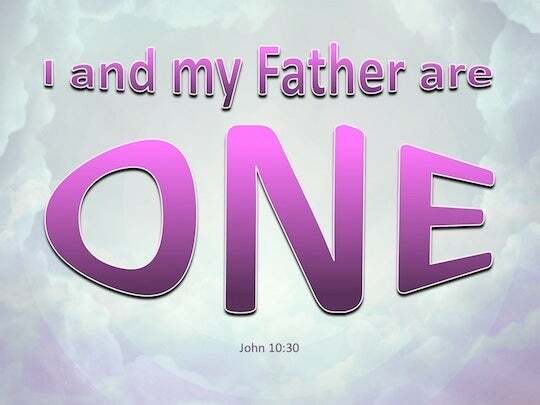 29 What, my Father, hath given me, is, something greater than all, and, no one, can carry off out of the hand of my Father: - 30 I and the Father, are, one. 31 The Jews again lifted up stones, that they might stone him. Jesus saith unto him - So long a time as this, have I been, with you, - and thou hast not come to know me, Philip? He that hath seen me, hath seen the Father. How art, thou, saying, Show us the Father? Originally, was, the Word, and, the Word, was, with God; and, the Word, was, God. Jesus said unto them - Verily, verily, I say unto you: Before, Abraham, came into existence, I, am. That they, all, may be, one, - even as, thou, Father, in me, and, I, in thee, - that, they also, in us, may be; - that, the world, may believe that, thou, didst send me forth. And, confessedly great, is the sacred secret of godliness, - Who was made manifest in flesh, was declared righteous in spirit, was made visible unto messengers, was proclaimed among nations, was believed on in the world, was taken up in glory. We know, moreover, that, the Son of God, hath come, and hath given us insight, so that we are getting to understand, him that is Real, - and we are in him that is Real, in his Son Jesus Christ. This, is the Real God, and life age-abiding. All things, unto me, have been delivered up by my Father; and, no one, fully knoweth the Son, save the rather, neither doth any one fully know, the Father, save, the Son, and he to whomsoever the Son, may be minded, to reveal, him. That, all, may honour the Son, just as they honour the Father: he that doth not honour the Son, doth not, in fact, honour the Father who sent him. Jesus answered, and said unto him - If any man be loving me, my word, he will keep, and, my Father, will love him, - and, unto him, will we come, and, an abode with him, will we make. All things, whatsoever the Father hath, are, my own; therefore, said I - Of mine, shall he receive, and announce unto you. And, all my possessions, are, thine, and, thy possessions, mine, and I have been glorified in them.